Made the reservation based on others’ reviews. Didn’t think it was anything special. Salad came out immediately and was obviously made hours before, plated and refrigerated. Short rib pasta was ok. Lukewarm. We did have a table by the window but the fountain show never happened when we were there. Definitely overpriced. This was an amazing dining experience. Everything from the bread to the drinks to the dinner was perfect, tasteful & delicious. We will definitely make this a go-to on our subsequent trips to Vegas. Everything from the drinks to the appetizers to the main entrees were amazing. I ordered the veal chop parmigiana and it was more tender and delicious than the veal I recently had in Tuscany. 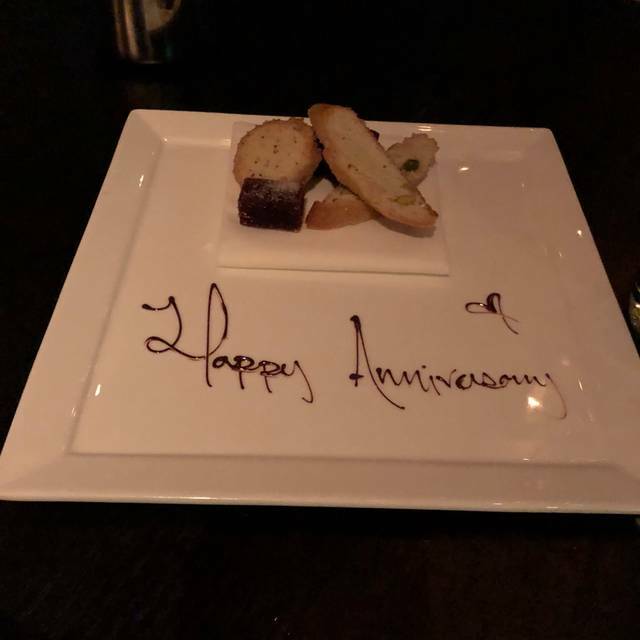 They brought a complimentary cookie dish for our Anniversary that was so delicate, sweet and buttery. The best anniversary dinner in a long time! Fantastic early dinner before a 7pm show. Beautiful interior, very attentive and warm service, AMAZING food - incl the tuna crudo, whitetail crudo, lamb agnotti pasta and pasta with scallops. Truly our best meal in Vegas this trip. We would return again. Ask to be seated by the windows to enjoy the view of the Bellagio fountains to the south. We had the chefs selection with wine pairing. Everything was excellent. Great service and the food was amazing. The restaurant had very dark lighting which was a little too dark as you could barely see your table mates and the food. Otherwise not too noisy at all. Great food and decor. Unfortunately we seemed to get a server who was not on his game. It looks like a real Italian restaurant, at least one the few "real" ones, which offers very good and well done food. From the appetizer to dessert, everything was good. Don't miss this experience. 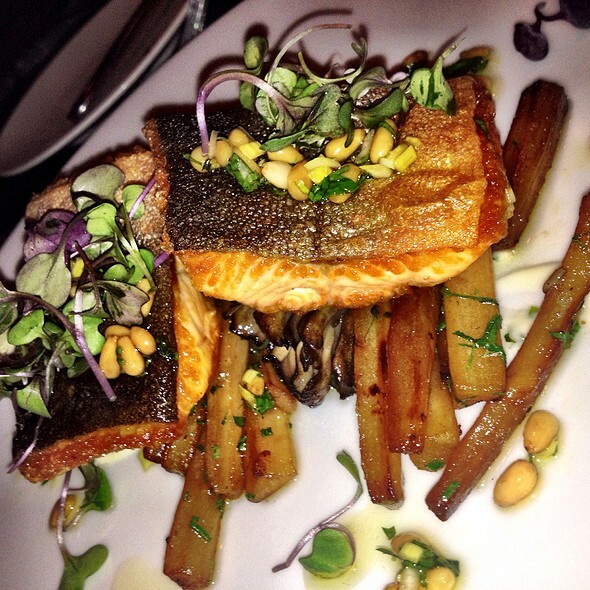 We are never disappointed at Scarpetta. Lovely dining room; spot-on service; food that is just fabulous. Caesar salad, veal parmesan on the bone, and whole branzino were perfectly prepared. Already looking forward to next year's visit! Had to wait 45 mins after our reservation time. A lot of bad attitudes from staff. Excellent food and nice ambience to have a group or just table for two. 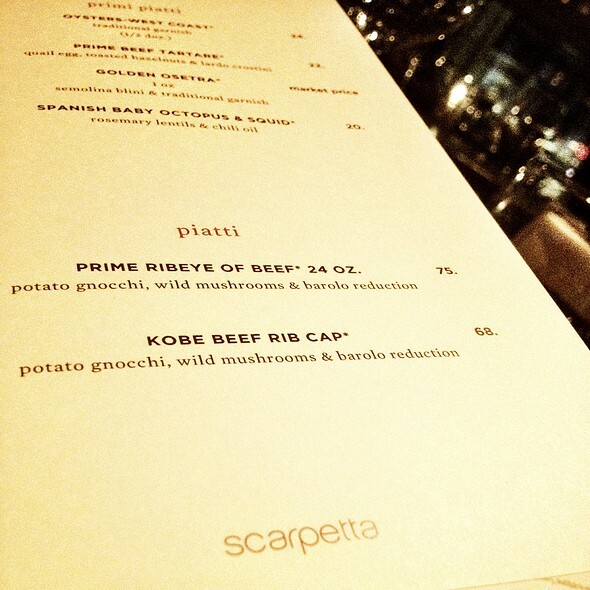 My companion and I had an excellent dinner and overall experience this past Sunday evening at Scarpetta. The tuna crudo and buffalo mozerella appetizers were a terrific start. I had a delectable whole fish (except for the head--which bummed my partner out since she wanted to eat that :) She had a simple but obviously satisfying pasta. The service was impeccable. The table with a view of the Bellagio fountains sparkled. We were seated toward the rear of the restaurant, so the noise level was moderate. The bar seating area beckoned to us, but the noise level there can be overwhelming with the casino just outside. I will be back again! 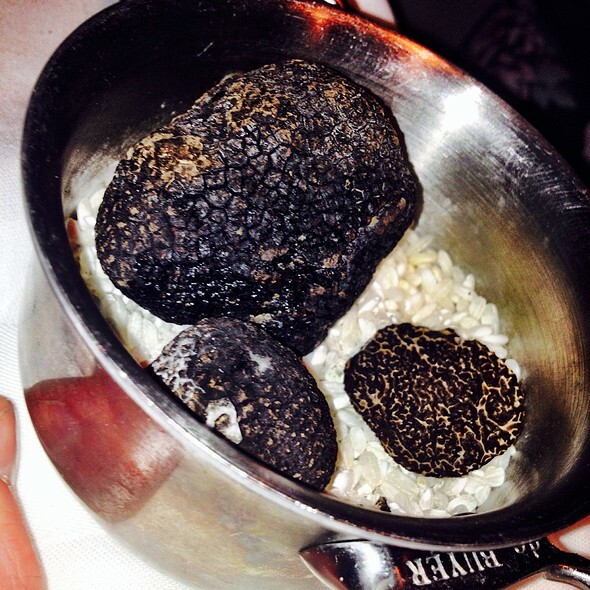 We had great service and a lovely meal at Scarpetta. My only complaint is that we over-ordered as the waiter told us the portions were small and they were bigger than we expected. I could have skipped my entree or shared an entree with my husband versus having my own. We started with the Tuna Crudo and the Burrata salad. Both were nice and flavorful. The tuna could get a bit hot if you got a lot a pepper in your bite. I just watched how much I had and pulled out a bit when I thought there was too much and it was fantastic. We then split the Tagliatelle which was also very good. I could have been done eating at this point, but we had entrees coming. I had the Spaghetti which was a nice flavorful spaghetti and my husband had the Veal Chop “Parmagiano”. It was very good but also very large. The two complimented each other very well. Unfortunately, I did not eat much of my spaghetti, only because I was getting full. Given we were celebrating, my husband insisted we ordered dessert. We tried the Salted Carmel dessert which was very good but also a bit rich. All in all a lovely meal and a great night out. Another great meal ! Thanks!! This continues to be the best pasta in town. the bartenders are fantastic, they like their jobs which you know in Vegas can be an issue. Nice experience. Would recommend to anyone wanting a restaurant at the Cosmopolitan but not a place I would frequent. We had to move our table twice and they were extremely accommodating. The food was delicious, the cocktail was good. I'd really enjoy the Sophia Loren cocktail, the oyster appetizer was the best, and our entre was not disappointing. 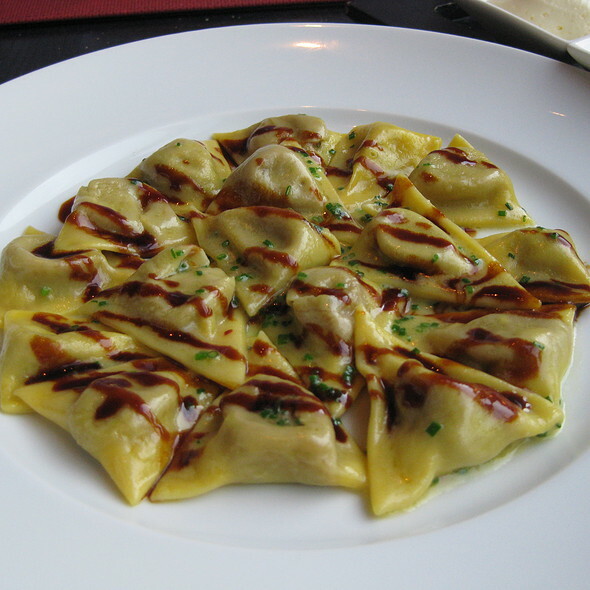 and our guest had the Veal Ravioli. We enjoyed it so much that my husband went back the next night for a business meeting with his clients. I had been a few times and had great experience but this time- the service was very bad. We waited forever to get someone to come to our table and had to continuously look for waiters to get us condiments and nobody ever checked on us. Very disappointing. The food also wan't as good as normally. The service was great and food was delicious. The restaurant was VERY dark. It was hard to see the menu or the food. Fantastic, food and service was great! The service was outrageously awful. We were waiting for drink for 20 minutes, appetizer for 40 min, main dish for 1,2 hour! We just got up and didn’t pay for anything! Amazing restaurant with amazing service. We wanted somewhere that felt intimate but still had a bit of a vibe and this completely hit the spot. Wonderful food and the best service I’ve ever had in Las Vegas. 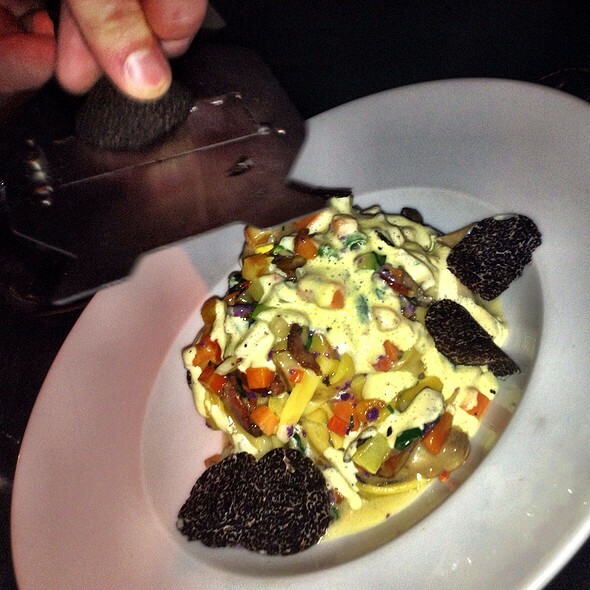 We first dined at Scarpetta in NYC and fell in love with the menu and style of service. 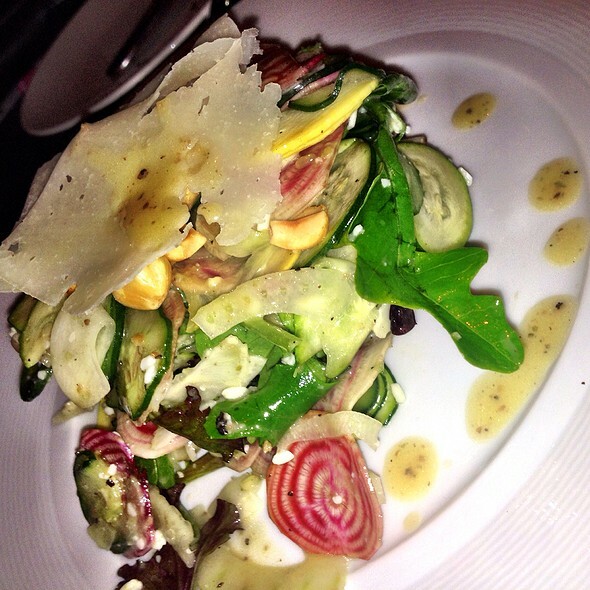 We were pleasantly surprised with the matched level of service and food quality at Scarpetta LV. I should have expected nothing less from Scarpetta and The Cosmopolitan. We got a beautiful table with the best view! Our waiter, Jason, was terrific! 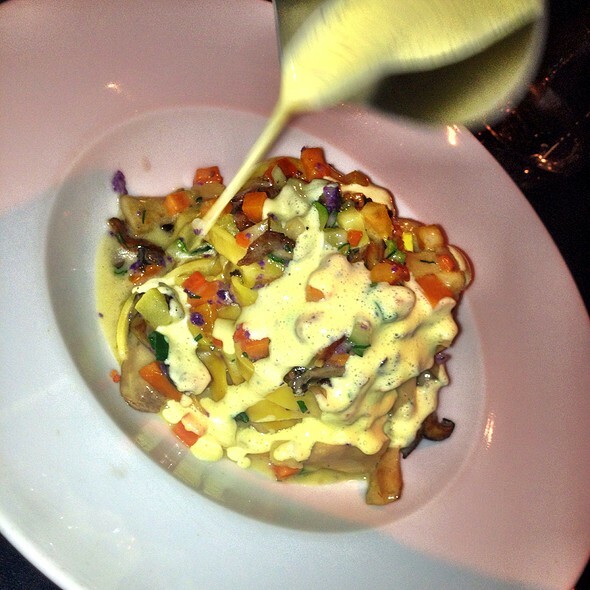 The Pici, lobster with homemade pasta was delicious! Service was perfect. Food presentation beautiful and flavors were very fresh and flavorful! Dinner at Scarpetta made it the perfect ending to our vacation. Our table overlooked the Fountain at Bellagio's. The service and the food was absolutely superb. Service was great. Our server checked up on us frequently and made sure our glasses were always filled. We started with the scallops and pork belly. The scallops were so good and both the scallop and pork belly were very soft and tender. For our entrée, we ordered the 44oz porterhouse steak and it. was. phenomenal. It was perfectly cooked (we ordered it medium) and seasoned. The charred peppers that came with the steak were also super juicy, sweet and flavorful. Good food. Great service. Would go again when I am back. 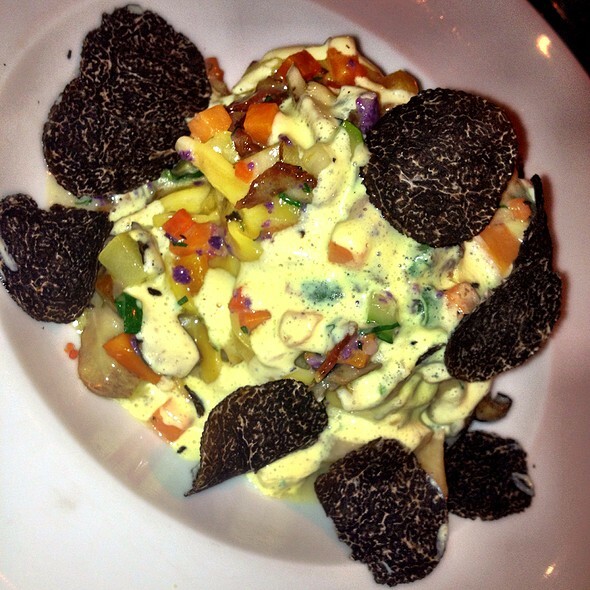 Outstanding food and atmosphere and professional service. Amazing food and great service! The entire experience was just absolutely amazing can't find a single thing I didn't like about this place. Food is excellent. Best spaghetti ever and. Great rib cap steak. Quiet setting in a busy casino with a nice view of the Bellagio fountains. Service was phenomenal!! Beautiful view with our table. Great first experience here. Outstanding. Food was amazing. We will definitely be back.